When handsome Prince Hugh falls in love with the beautiful swordsman Briar, his father will do anything to drive them apart. Tortured by a vicious king because he dared love his son, Briar is sent to the forest for execution only to be rescued by the feared women warriors of Gildenhyte. In a world where only the strongest survive, three unstoppable loves emerge from the wreckage of an evil ruler's manipulations to forever change the kingdom of Alistwall. When Prince Hugh reached twenty years of age, his father sent for the greatest known swordsman in the land to further his training. Abel didn't live within the King's realm, but in the land of Wildridge, on a mountaintop temple with the monks who had taught him to be a warrior and a healer. If not for a past incident, which bound him and King Ruben, Abel wouldn't have agreed to teach swordsmanship to anyone outside the temple. Hugh had learned everything the royal fencing masters had to teach and looked forward to learning from this unsurpassed swordmaster of whom his father, a man not easily impressed, sang praises. Hugh hadn't expected his new teacher to arrive in the company of a stunning youth of his own age. When they entered the great hall, neither bowed to the king or the prince. Hugh's father had explained that the monks believed that no man should bow to another. King Ruben, not typically an understanding man, overlooked Abel's "excessive pride." Abel was an attractive man of middle years and average height with a fit build that a man half his age would envy. His lively blue eyes took notice of everything around him. He wore his wavy brown hair to his shoulders and dressed in the short black tunic and trousers favored by the monks. The older swordsman didn't catch Hugh's interest, however, but the young man who stood beside him, about the same age as Abel, did. About the same height as his master, but much slimmer, he had glossy, sable hair bound at his nape with a strip of red cloth. His moss-colored eyes exuded strength and serenity. The faintest smile tugged at his unusually dark pink lips when his gaze met Hugh's. The lower lip was much fuller than his top one, and Hugh had the almost overwhelming urge to kiss those pretty lips. "Abel, I'm pleased you agreed to come," King Ruben said. Abel nodded, then gestured to his companion. "This is my son, Briar. He's come to help with the prince's training." Hugh's heart actually skipped a beat. 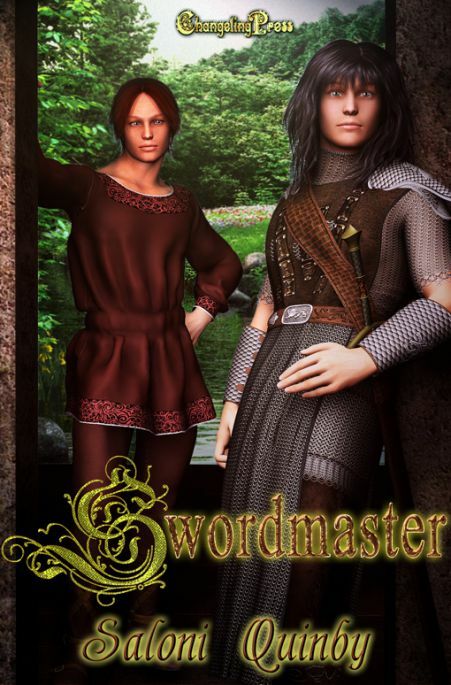 He wouldn't mind a taste of Briar's sword, and not the steel one sheathed behind his back. "Excellent," said the king. "Young men make better sparring partners for each other. We're not getting any younger, you and I, are we, Abel?" A smile flirted with Abel's lips. "Speak for yourself. Briar is more than a sparring partner. He's trained at the temple practically all his life and is preparing to follow in my footsteps as an instructor there." "I'm sure you'll find Hugh's skills up to par," the king said. "He's trained since he could hold a sword." Briar's gaze continued holding Hugh's, and the prince couldn't have looked away even if he'd wanted to. "My servants will show you to your quarters so you may refresh yourselves after your journey." The king motioned for a male servant and said, "See that a second room is prepared for Briar." The servant bowed and hurried off to carry out his orders. "I'll accompany them, Father," Hugh said. He could scarcely wait to speak to Briar away from the formalities of the court. "You may go." The king waved his hand. Hugh rose from the chair beside his father and approached his new instructors. He led them out of the great hall and up the stairs to the chamber that had been prepared for Abel. "The maid will see to your needs," Hugh said, referring to the silent woman who stoked the fire in the hearth across the room. He turned from Abel to Briar. "When your room is ready, a servant will come for you." "Thank you," Briar said and moistened those fascinating lips. "I look forward to starting our training." "So do I," Hugh said, unable to keep from smiling a bit. Abel cleared his throat. Hugh glanced at him, but Briar still stared. It took all Hugh's self-control to leave the room without touching Briar. Even the slightest brush of his shoulder or sweep of his fingertips would have soothed his hunger a bit. Or perhaps not. Training with Briar would surely be a distraction, and that was the last thing one needed when dealing with swords. After the prince left, the maid soon followed, promising to return momentarily with a meal. Once they were alone, Abel glanced at Briar. "Remember what I told you before we arrived? Life is different here than at the temple." "I remember. Have I done something wrong?" "That's the prince you were flirting with." "Flirting? Me?" Briar again feigned innocence, but truly, how could he help flirting with the handsome prince? He hadn't expected him to be so beautiful. Hugh nearly took Briar's breath away. "Listen to me." Abel placed his hands firmly on Briar's shoulders. "Just because I agreed to come here to train Prince Hugh, just because King Ruben and I once saved each other's lives, doesn't mean I don't know what kind of man he is. He'll tolerate certain behavior from us, but some things he won't overlook." "Hugh is Ruben's son. His life is preplanned. He'll marry, produce heirs, and inherit the crown." "I saw how you were looking at him. More important, I saw how he was looking at you. He's his father's son." "You don't know that. After all, you've never met him"
"Believe me. I know. All royals are alike." Briar placed his travel bag on the foot of the large bed and sighed. "Maybe." "Why are you telling me this? It's not as if I plan on spending the rest of my life here." Abel cast him a warning look. "All I'm telling you is keep your mind on training." Briar shrugged, his smile broadening. "Of course. I always do. Don't worry." "If I could trust you to do what you're told, I wouldn't." "The monks say I'm intuitive. Animals go by instinct and so should we." "Animal instinct is what concerns me." "Father!" Briar laughed and playfully shoved Abel's broad shoulder. Shaking his head, Abel smiled in spite of his sullen mood. Briar had a talent for making people smile that was nearly as powerful as his talent with a sword. He wondered if his charms would work on the prince. Despite his father's warning, he wouldn't be able to resist finding out.